In a Q&A with journalists on his way from Africa back to Rome, Pope Francis answered questions posed by journalists from across the world. He touched on inter-religious relations, the role of the media, and his favorite memories from Africa. There’s an economic system where money is at the center, the god of money. I remember that once a great French ambassador told me this expression – and he was not Catholic – “Nous sommes tombés de l’idolâtrie de l’argent” (speaks in French, “We have fallen into the idolatry of money”). If things continue like this, then the world will continue like this. I don’t want to give a homily, but the Lord always rebuked the people of Israel…that we accept and adore, because the word is god, idolatry. Idolatry is when a man or woman loses their identity card for being a child of God, and prefers to look for a god according to their own measure. That’s the beginning. If mankind does not change we will continue to have more miseries, tragedies, wars, children who die of hunger, of injustice. What does one think of those who have 80 percent of the world’s wealth in their hands? And this is not communism. This is the truth. But the truth is not easy to see. Thank you for this question. And the first question, what was it? The moment I remember? The crowds. That joy. That capacity celebrate on an empty stomach. But for me, Africa was a surprise. I thought, God surprises us, but even Africa surprises us. There were many moments. But the crowds, they felt visited. They have a very great sense of welcome. I saw in the three nations that they had this sense of welcome because they were happy to feel visited. Moreover, each nation has its own identity. Kenya is a little more modern, developed. Uganda has the identity of martyrs. The Ugandan people, both Catholic and Anglicans, venerate the martyrs. I was at both shrines. The Anglican one, and then the Catholic. The memory of the martyrs is their ‘identity card,’ the courage to give their lives for a cause. The Central African Republic: the desire for peace, for reconciliation, for pardon. Until four years ago they had lived together – Catholics, Protestants, Muslims – like brothers! Yesterday, I went to the Evangelicals, who work hard. And then they came to Mass in the evening. Today I went to the mosque. I prayed in the mosque. Even the Imam got into the popemobile to take a ride around the small stadium. These are small gestures, is that which they want. Because, there is a small group, I think, that is Christian, or they say they are Christian, which is very violent. I don’t really understand this. But, it’s not ISIS, it’s another thing. It’s Christian. (The people) want peace. Now, they are having elections. They have chosen a state of transition. They have chosen that woman, who was mayor to be President of the Transition, and she now organizes the elections. But, they are seeking peace, reconciliation, not hate. Not hate. Philippine De Saint-Pierre, KTO (France): Holiness, good afternoon, you paid homage to the platform created by the archbishop, the imam and the pastor of Bangui. Today more than ever, we know that fundamentalism threatens the entire planet. We also saw this in Paris. Before this danger, do you think that religious leaders should intervene more in the political field? 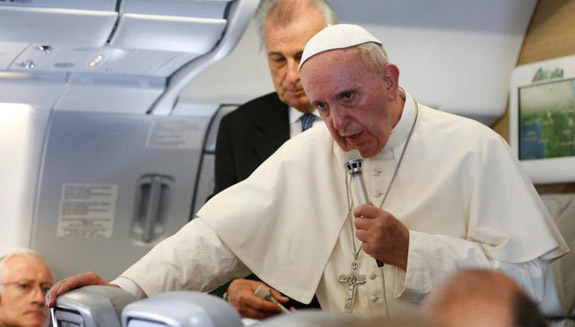 (Pope Francis asks for clarification) …the religious “dignitaries,” bishops and imams? Pope Francis: “To intervene in the political field.” If that means to make politics, no. Whoever is a priest, pastor, imam, rabbi, this is his vocation, but they make a “live politics” by preaching values. True values. And one of the greatest values is the fraternity among us. We are all children of God. We have the same father. In this sense, we have to make politics of unity, reconciliation. A word that I don’t like, but I have to use it is “tolerance.” But, not only tolerance, co-existence, friendship. That’s how it is. Pope Francis: I think an error was made. Msgr. Vallejo Balda entered for the role he had and he had it up until now. He was secretary of the Prefecture of Economic Affairs. (That’s how) he entered. How she entered, I am not sure, but I think I’m right – but I think, and I am not sure, I think that it was he who introduced her as a woman who knew the world of commerce and such, no? They worked. When the work was done, the members of that commission that was called COSEA remained in some of their posts in the Vatican. Vallejo Balda was one. But, the woman, Chaouqui, did not remain in the Vatican because she entered with the commission and she didn’t remain. Some say she was upset about this, but the judges will tell us the truth about the intentions, how they did it. For me, it was not a surprise. I didn’t lose any sleep because it showed the work that had begun with the commission of cardinals, the C9, of seeking out corruption and things that don’t work. And here, I want to say something, not about Vallejo Balda and Chaouqui, but everything. And then I’ll come back to this if you want. The word “corruption,” one of the two Kenyans mentioned it. Thirteen days before John Paul II died, in that Via Crucis the then-Cardinal Ratzinger, who was leading the Via Crucis, spoke of the filth in the Church. He denounced it first. Then, in the Easter Octave after this Good Friday, Pope John Paul II died and he became pope. But, in the pro-eligendo pontefice Mass, he was Dean – or he was Camerlengo, no Dean – he spoke about the same thing, and we elected him for that freedom in saying things. So since then, it’s been in the air that in the Vatican, there is corruption. There is corruption there. Juergen Baetz, DPA (Germany):Your Holiness, HIV is ravaging Africa. Medication means more people now live longer, but the epidemic continues. In Uganda alone there were 135,000 new infections of HIV, in Kenya it’s worse. It’s the greatest cause of death in Africa. Your Holiness, you have met with HIV-positive children, you heard a moving testimony in Uganda. Yet you have said very little on the issue. We know that prevention is key. We know that condoms are not the only method of solving the epidemic, but it’s an important part of the answer. Is it not time for the Church to change its position on the matter? To allow the use of condoms to prevent more infections? Pope Francis: The question seems too small to me, it also seems like a partial question. Yes, it’s one of the methods. The moral of the Church on this point is found here faced with a perplexity: the fifth or sixth commandment? Defend life, or that sexual relations are open to life? But this isn’t the problem. The problem is bigger…this question makes me think of one they once asked Jesus: “Tell me, teacher, is it lawful to heal on the Sabbath? Is it obligatory to heal?” This question, “is doing this lawful,” … but malnutrition, the development of the person, slave labor, the lack of drinking water, these are the problems. Let’s not talk about if one can use this type of patch or that for a small wound, the serious wound is social injustice, environmental injustice, injustice that…I don’t like to go down to reflections on such case studies when people die due to a lack of water, hunger, environment…when all are cured, when there aren’t these illnesses, tragedies, that man makes, whether for social injustice or to earn more money, I think of the trafficking of arms, when these problems are no longer there, I think we can ask the question “is it lawful to heal on the Sabbath?” Because, if the trafficking of arms continues, wars are the biggest cause of mortality…I would say not to think about whether it’s lawful or not to heal on the Sabbath, I would say to humanity: “make justice,” and when all are cured, when there is no more injustice, we can talk about the Sabbath. Pope Francis: I am not sure. I am not sure. But, I can tell you: (it’s) now or never. But, from the first that was in Tokyo, no. They did few things. Every year, the problems are more serious. Speaking to a meeting of university students about what world we want to leave our children, one said, “But are you sure there will be children in this generation? We’ve reached the limit.” We’re on the verge of suicide, to use a strong word. And, I’m sure that nearly the entirety of all of those in Paris for the COP21 have this awareness and want to do something. The other day, I read that in Greenland, the glaciers have lost thousands of tons. In the Pacific, there’s a nation buying land from another nation to move the country because within 20 years it won’t be there any more. I am confident, I’m confident that these people will do something because I’m sure that they have the good will to do it. And I hope it happens and I pray it happens. Pope Francis: They have virtues, many virtues and these virtues are constructive. I also have the experience of friendship – it’s a strong word, friendship – with a Muslim, a world leader, we can talk, and he had his beliefs and I had mine, he prayed and I prayed. (There are) many values, prayer for example, fasting, religious values. Also other virtues…We can’t cancel out a religious because there are some, or even many fundamentalist groups at a certain point in history. It’s true, wars between religions have always been there throughout history, always. We also need to ask for forgiveness, Catherine de’Medici was no saint, and that 30 years war, that night of St. Bartholomew, we must also ask for forgiveness from the fundamentalist extremists in the religious wars. But they have virtues, one can dialogue with them. Today I was at a mosque, an Imam prayed with me, he wanted to go around the small stadium with me in the popemobile, where there were many who couldn’t enter, and in the popemobile there was the Pope and an Imam. It was possible to speak. As everywhere, there are people with religious values, there are people who don’t…how many wars, not only religious, wars we Christians have made. It wasn’t the Muslims who did the Sack of Rome. They have virtues.